Jan Davidszoon de Heem, Jan Davidsz, or de Heem, better known as Jan de Heem, was born on April 17, 1606, in a Dutch family of undistinguished painters at Utrecht. He specialized in still life Baroque painting in both, Dutch and Flemish genres. Jan’s father Jan de Heem and brother David Davidszoon de Heem were only average artists. Though, David de Heem the Elder could not establish himself as a great artist, his early training laid the essential foundation for Jan de Heem’s remarkable career. The painter’s second coach was pioneering Dutch painter Balthasar van der Ast, who taught him painting shell life, fruits, and vegetables. During 1625-29, Jan resided in the city of Leiden, Netherlands, and learnt painting under artist David Bailly during the last year of his stay there. During this phase, in 1626, the artist married Aeltjn van Weede. During 1635 to 1637, Jan became a member of the painter’s guild of Antwerp and was by now being counted among the bourgeoisie of the city. In the beginning, his style carried certain similarities with that of Dutch painter Aelbert Cuyp, for instance, his painting in the Gotha Art Gallery in Germany. As he advanced in his career however, Jan created a niche for himself through his uncanny ability to capture the artistic subtlety of vegetated state (fruits and vegetable) and life (beautiful insects and animals of land and sea), alike. His works did not merely revolve around vain artistry rather they often conveyed moral lessons embedded in them, beautifully. His celebrated works graced various museums and castles worldwide, including the museum of Amsterdam (1640), Langford Castle (1645), the Belvedere of Vienna (1648), the museum of Berlin (1650), art museum Alte Pinakothek (1653), the State Hermitage Museum at St. Petersburg (1655), and the art gallery of Brussels (1668). Through all these exhibitions through Europe, Jan married for the second time, to Anna Ruckers, in 1643. 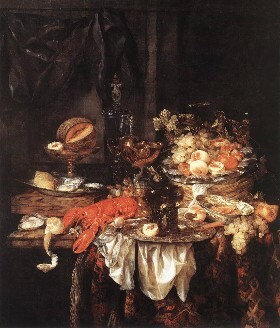 His two marriages bore him nine children in all, of which three, David Janszoon de Heem, Cornelis de Heem, and Jan de Heem, went on to become painters. His sons’ works had such similarity with his own works that they were very difficult to discriminate. After his long stay in Antwerp until 1667, Jan went back to Utrecht, for a brief spell of three years. At the time of invasion by French King Louis XIV, he left for Antwerp in 1971 to remain there for the rest of his life. The exact date of his death is still disputed although, he is said to have breathed his last around April 26, 1684. This entry was posted in Arts and Entertainment on December 16, 2013 by admin_z.